What do you do with your old clothes? Throw them away? Donate them? Upcycling, or repurposing, old clothes is a fun and easy way to get nearly new pieces of clothing and accessories at a minimal cost. Choosing to repurpose old items is a great way to extend their lives and even make something really interesting and unique to add to your repertoire. Beyond this, upcycling clothing is very environmentally friendly, especially when you consider that Americans only donate or recycle 15 percent of their used clothing and the rest, over 10 million tons, wind up in landfills every year. We might not recognize it, but the process required to produce clothing can also have a negative environmental impact. Bleach, formaldehyde and other toxic chemicals are used to dye and treat clothing. These pollutants can easily pollute waterways and pose health risks to humans and marine life. Non-organic cotton is one of the most pesticide intensive crop in the world. Cotton is also treated with herbicides that can persist in the fabric, meaning they are released from the garment over many years. Thankfully there are thousands of creative minds out there that have come up with some brilliant ways to upcycle old clothes and accessories. Reusing and repurposing old materials can help keep clothing waste out of landfills and reduce the demand to produce more clothing, accessories and other products that require environmentally-demanding processes. Besides, we think any excuse to have your friends over for a craft night is a good one. 1. Take an old t-shirt and turn it into a reusable grocery bag. Trying to cut plastic bags out of your grocery shopping routine? Why not upcycle one of your old t-shirts and make your very own eco-friendly bag. Find instructions on how to make your own here. 2. 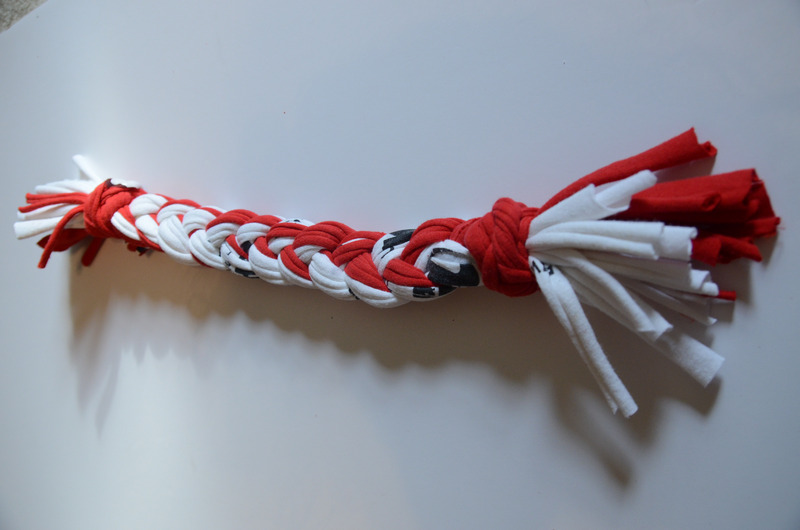 Turn an old t-shirt into a braided belt. We all have a massive stack of t-shirts we never wear sitting somewhere in our homes, why not put those shirts to use! Learn how to make your own shirt belt here. 3. Upcycle an old sweater and make a brand new decorative pillow. Decorative pillows can be price-y, plus if you are trying to avoid down stuffing or unwanted chemicals, making your own can be a great option. Learn how to make these DIY pillows by clicking here. 4. Transform an old sweater into a new winter scarf. Before you throw that old, misshapen sweater away, check out this pattern to learn how to make it into a warm scarf for winter. 5. 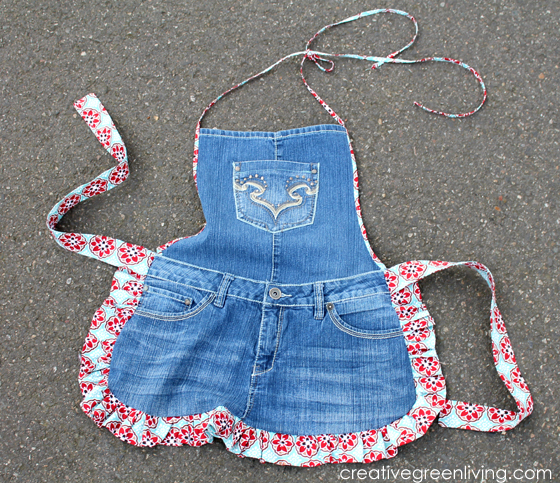 Repurpose old jeans to make an apron. We all went through the embarrassing over-all phase at one point in time. Rather than hiding those denim beauties in your attic, turn them into something useful. Click here to learn how. 6. Make a denim rug out of some old jeans. When you buy a new carpet, you might be inviting lots of nasty chemicals to off gas in your home. 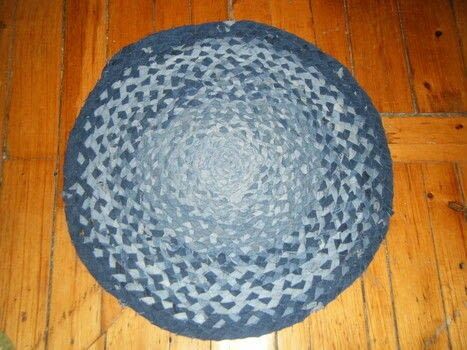 Instead of purchasing a new rug, try making one from all those old jeans you’ve got laying around. Click here for instructions. 7. 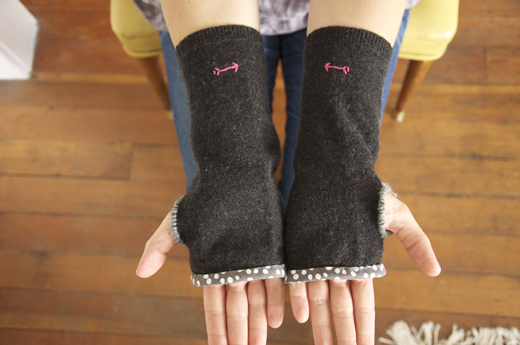 Turn an old sweater into a pair of winter gloves. You’ve probably worn your old sweaters to the point that they have holes in them anyway, so why not turn them into gloves. Learn how, here. 8. Make a brand new pet bed out of an old sweater. Whose pet doesn’t love snuggling up with clothes that smell like their favorite people? Try making your best friend a bed from an old sweater – maybe this will keep them from curling up in your clean laundry. Instructions to make this bed can be found here. 9. 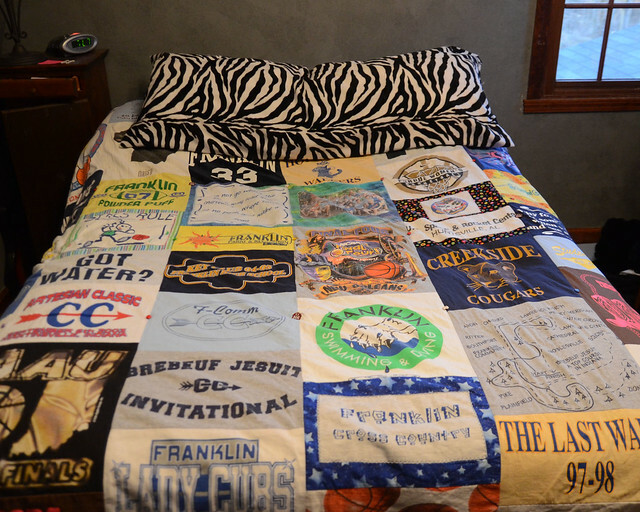 Turn a bunch of old t-shirts into a quilt. We keep novelty t-shirts because they remind us of events we participated in or concerts we saw, so why not arrange these memories into a quilt. These make great gifts for friends and are sure to get more use than they would in their original form. Learn how to make your own quilt, here. 10. Make a dog toy from your old t-shirts. Chances are that after making a number of these items you still have bits of t-shirt left over. Don’t waste these either! Click here to learn how to take those shirt scraps and turn them into a fun toy for your pup. So Green Monsters, what’s your favorite way to upcycle old clothes? Share in the comments! I love every one of these ideas. I once made a purse and change purse from old jeans.